We know it’s always the same desperate list of symptoms that include watery eyes, runny nose, stuffy nose, sneezing, and itchy eyes. It’s too much for a young body to endure. 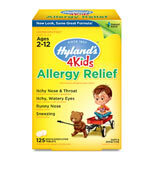 That’s why we’re so happy to provide Hyland’s 4 Kids Allergy Relief to soothe and diminish the body’s natural reaction to bad indoor and outdoor allergies. Its safe and effective formula is nothing to sneeze at! Children ages 2-5 years: Dissolve 2 tablets under tongue every 15 minutes for up to 8 doses until relieved; then every 4 hours as required. Children ages 6-11 years: Dissolve 3 tablets under tongue every 15 minutes for up to 8 doses until relieved; then every 4 hours as required. Children 12 years and older: Dissolve 4 tablets under tongue every 15 minutes for up to 8 doses until relieved; then every 4 hours as required or as recommended by a health care professional.